I’m an academic writer and teacher working on my second major book project on subjects that aren’t nearly as fun, wide-ranging, and approachable as the ones I treat here (Latin America, anthropology, gender studies), so this blog serves as an outlet and a reminder to me that writing is fun as well as hard — as well as a reminder that writing is the only thing I can do. This reminds me how much I want to be both autodidact and dilletante. This blog is, in part, about feminism: the importance of achieving equality for women is not up for debate. I will delete all comments that assume otherwise. I do believe that how that equality is achieved is subject to discussion, and I welcome it here. Why movies? I persist in believing that there are possibilities in film for transformation; and I also see the medium’s limitations. Movies are one site where women are sidelined and stereotyped, yet films also continually surprise and delight me with exceptions to that rule. My own taste in film is wide-ranging and voracious — and while I have a greater-than-average love of foreign, experimental, and indie films, I also love classic and popular film with a passion that almost feels like the love one feels for one’s closest friends and family. That’s the thing: ultimately I just love movies, and I also want to beg them to reflect gender equality far more than they do at present. I began this blog on an auspicious day: when the first woman in the history of film, Katherine Bigelow, won an Oscar for best director (and best picture) with The Hurt Locker. The fact that it has no women in it spurred my criticism initially, for I am always disturbed by the fact that one avenue for women to achieve power is either to ignore feminism or become active anti-feminists. I think film can do better. Why “Didion”? 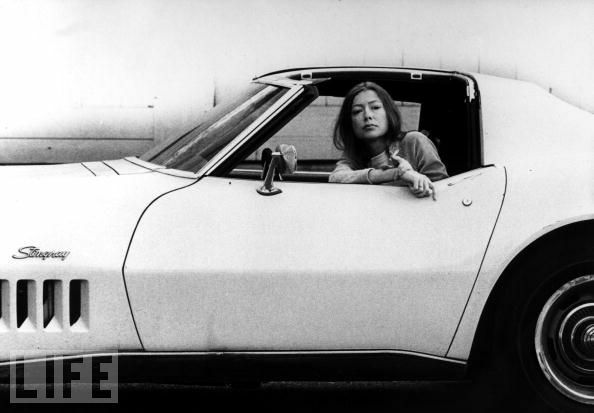 Because Joan Didion rules. “We tell ourselves stories in order to live,” she wrote in The White Album. And is there anyone who could have looked cooler, or more like someone you’d like to know, than she did here? I can be reached at didion [at] ymail [dot] com. Oh, hooray that there are compatriots out there! I think you dated yourself as soon as you mentioned typewriters, and even before that – with your choice of Rosalind Russell as your picture. I won’t even try to guess what film that image is from. But we who read you don’t care how old you are. Besides that – I still love to read your words. I teach at the college level, and although I’m not as old as Rosalind Russell I did take a typewriter with me to college. It was all laptops, though, by the time I got to grad school — and thank god, because if I’d had to write my dissertation on a typewriter…! I found your blog through the WordPress tag surfing feature, and I just want to let you know I’m enjoying it! As a psych and film student who is often told that I have a “feminist problem” with movies, I’d like to thank you for taking the time to write these thoughtful articles. Your blog has given me a stronger appreciation for films I’ve seen along with some great suggestions. I even find myself perusing this site during class, which you no doubt find blasphemous as a professor, but I can assure you that it’s only during psych lectures 🙂 Since we seem to be on the same cinematic wavelength, I wonder if you’ve gotten the chance to see Cracks by Jordan Scott? I don’t know it — but it’s got terrific reviews. Why isn’t it on DVD yet? Or at least it’s not on Netflix or at my terrific video store. Did you see it in the theater or at a festival? Thanks so much for your kind comments! Not just for the rush of flattery but also because sometimes it seems one posts one’s thoughts to a very, very quiet universe! And please keep commenting. I heard about Cracks when I was in Toronto for Edgefest in 2009. I got it from Amazon and just saw the other day that its premiering by me in Philly. So technically, it hasn’t been released for dvd in the US. If that’s your reaction to The Hurt Locker, what do you think of Claire Denis’ “Beau Travail”? Haven’t seen it yet — in fact, I’m relatively new to Denis and am slowly working my way through her films. (See, for example, my long conversation with another blogger last month about White Material.) Likewise Breillat. Tell me more — did *you* like Beau Travail? I do love to get new recommendations. I did love “Beau Travail”, but I will confess there is a weird dissociation between my feminist attitude towards every day life and my artistic interest. My dissertation was on Latin American crime novels, and I love noir in particular. Regarding “Beau Travail”, I also watch is in a movie theatre (3 times), so it probably makes a difference. I don’t know if I am interpreting your post correctly, but I don’t think that The Hurt Locker is anti-feminist. You can certainly say that it ignores feminism, but for some reason, Bigelow’s films are better when they are set in an all male environment (I really did not like Blue Steel). Oh no, I absolutely would never say The Hurt Locker is anti-feminist! My problem was with everyone saying that her Oscar was a feminist victory. A victory for women, yes. But as you point out on your excellent blog, something might be good for women that has nothing to do with feminism — it’s worth keeping those things separate. While I do think it’s important that women win awards like that which have been historically closed to women, I find it telling that they gave the award to a film about men. Obviously, I celebrate Bigelow’s ability to make whatever kind of film she wants. And as my blog makes clear, I watch all kinds of films and enjoy them immensely. But as a feminist, I use this blog as a way to call for more film about women, with interesting roles and plum directing spots for women. I think it’s because of my experience as an academic — both as a teacher and as a member of the faculty alongside a lot of men who absolutely cannot see how much their everyday behavior makes an environment toxic for their female colleagues. BTW, I can’t find your Hurt Locker post! I do have a background in Film Studies, so it drives me nuts when professors in a Latin American Civilization class use a film to illustrate just a historical period, and can’t say more than “…and this is how “La Historia Oficial shows the story of the “dissapeared” in Argentina. By the way, I saw in my blogroll that you had a post published called “The Director who loved women”, but when I click, it goes to “Page not found”. I thought I would be reading a post on Truffaut. I also have some posts on movie suggestions for Latin American courses (I noticed in your description that that’s part of your field). I’m usually more interested in the political (not that you can dissociate the two, but sometimes it happens). By the way, I have a post on the Hurt Locker, and one on feminism and my academic interest. You probably won’t agree with them, but I would love your input if you care to read them. Reading your posts, I often wonder how much our reaction to a movie is influenced by our expectations going in — and whether we shouldn’t question our expectations so our review is more about the movie and less about our own prejudices and preconceptions. For example, should we never give a film more than seven minutes to capture our attention? Should we write off a film because the plot seems unrealistic or the ending is too ambiguous? Because there aren’t enough zingers or the pace is too slow for our mood? If we agree that the only rule is that a movie should never bore us, why are we so easily bored. Is the problem in the stars, or in us? Is it too easy to criticize films or too hard to make them? Are we 100% sure we could write a better script? Or direct this particular story to be more enjoyable or have greater impact? Does the audience have any responsibility to the craft or the business? Or is “I know what I like” the best and only standard? If so, how will cinema evolve? By more special effects? In our effort to appear critically fashionable and timely, are we overlooking the work of many talented and highly motivated craftspeople who labor to bring a film to life. Do we oversimplify the creative process when we pan a film that misses our personal emotional delivery targets? Do we cheat filmmakers as well as ourselves by our pigeon-hole reviews? Recently, Meryl Streep remarked on 60 Minutes, “I know the acting is better today, than it was when the classics were made.” And she followed up by reminding us that there is an industry conspiracy to discourage filmgoers who don’t purchase tie-in merchandising products. Filmgoers might want to think about Ms. Streep’s remarks. We might try watching without our eyes wide shut. But I’m not a professional film critic. In fact, I keep this blog more as a film fan than as a true critic. Lots of times it feels as if I’m the very last person to see a film, unless it’s a little-known gem that pops up online or which I discover in my public library’s collection. So when I write about loving or hating a film, it’s in the same voice as I would talk about to my friends at a cocktail party — I think of film as a great democratic medium of our time, and as a medium that I love more than any other. I embrace the subjectivity of my views of film and love to argue when I encounter someone with a very different take. Sometimes I go further in my analyses of film, and to this I acknowledge my scholarly/academic training. I’m not a film scholar, but I sometimes like to pretend to be one, and I read more in that field than I ought to considering my other academic responsibilities. So in some ways I position myself here as someone who’s just like the rest of us, except more so — I love movies, I go to movies, and I love love love to write about movies. And there’s one other layer, of course: I use this blog to speak as a feminist film fan, to celebrate women’s achievement onscreen and to think “aloud” about the politics of women’s appearances there and behind the camera. One of the things I’ve always taken very seriously here is the way women appear less onscreen, direct and write and produce fewer films, and are given less breadth in their personal appearance than men are. So as much as I love film, I also want to hold it accountable for reflecting rather than challenging the status quo. That’s my immediate response. I’d love to hear more about your perspectives and how you think film criticism can be more effective, more democratic, more creative, and so on. How about giving us your take on A Separation, which was nominated for Best Foreign Film last year. I’d be interested to hear how the Iranian drama resonated with you. Oh, how did I love A Separation?! Such an amazing film about guilt and retribution and responsibility. My partner could barely stand it for its grimness. We laughed a lot about the fact that I would have watched the whole thing again, immediately after seeing it. I’d love to talk more about it. I’m curious what you thought, FD — was it too grim? or did the themes resonate with you? I did not find A Separation grim, but I didn’t think the movie Away from Her was grim either. I thought A Separation was an extremely well-written and beautifully acted film — it seemed more like a documentary, than a fictional story. I was fascinated by the central questions the movie raises including What is the truth? The movie reminded me Igmar Bergman films, as well as Herman Melville’s story, Benito Cereno, which mines some of the same territory. I particulalry liked how the director reveals the inadequacies of religion, laws and other social institutions, when faced with complex, moral questions. I think “thorny” is a better adjective than “grim” to describe the tone and content of A Separation. I thought the ending was excellent — what would you have guessed the daughter would do given all she learned about her parents? I completely agree with you, FD — not least on its wonderfully complicated view of those questions. It has to have been the smartest film I’ve seen all year. It just doesn’t stop turning the narrative; just when you think you catch a glimpse of the characters’ responsibilities (even given their problematic situations, whether it’s that a man needs to care for his father with dementia or a mother who brings her rambunctious little girl to work with her) the story turns again, up-ending your expectations. Just amazing. Just thought you might be interested in this article about female television writers (or lack thereof). Here’s the link. Oh, man. So frustrating. Many thanks for this link, FD — I’d seen the Geena Davis study but not this one from the Writer’s Guild. I just wanted to let you know how much I enjoy your blog in every possible way–the content, the writing, the humor, the aesthetics. Thank you, Wendy! what kind words! And let me say that my delay in responding had everything to do with power-binge-watching four episodes of Orphan Black last night … love the central actress. I’ll let you know what I make of the story as it continues to develop. Many thanks for the recommendation. Where do I find your writing now (me, who is so late to find your blog, and is in dire agony at the death of The Toast) ? !